This month, your mission is to fly to Tioman Island in the South China Sea. Tioman Island Airport has a 3200-foot runway that requires pilots to flight directly towards a mountain before making a quick 90-degree turn to final. Because of the surrounding mountains, it’s a one-way approach with no missed option. So, you need to get it right the first time. 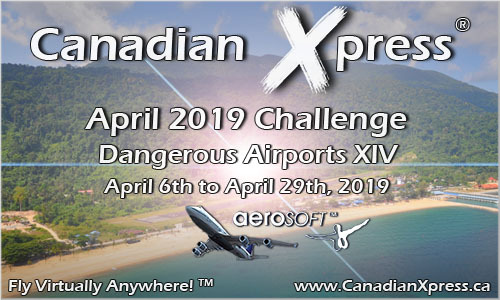 The April 2019 Challenge is open to all Canadian Xpress pilots from April 6th until April 29th, 2019 so join Canadian Xpress today by visiting http://CanadianXpress.ca .